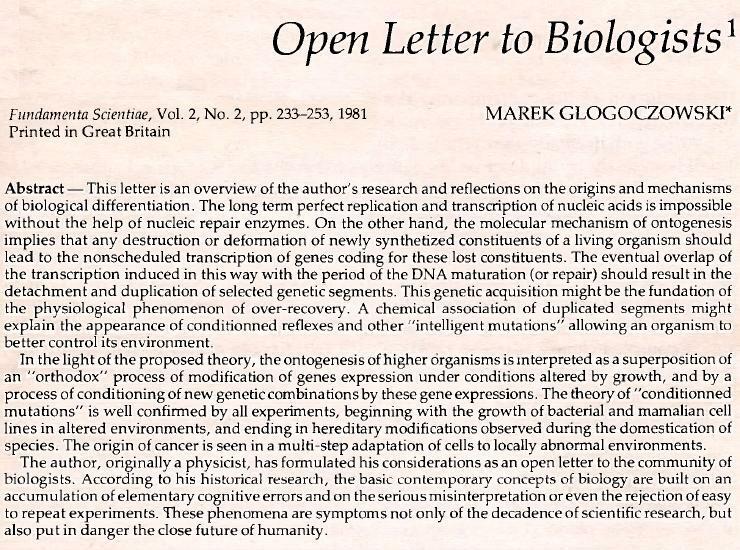 Below you will find the Abstact and two essential pages from my “Open letter to Biologists”, published in quartely Fundamenta Scientiae, 2/2, 233-253, Pergamon Press, Oxford, 1981. These pages demonstrate how the CREATION OF NEW INFORMATION, in form of novel genetic associations, MUST RESULT FROM REPEATED EXERCISE OF ORGANS PARTICIPATING IN RECOVERY from various perturbations of organism’s homeostasis. Author suggests that so called ‘conditionned reflexes’ originate at the level of ‘selected by their use’ gene associations inside participating in these movements tissues – which phenomenon permits to memorize “acquired by a training” behaviors for several decades of individuals persistence.